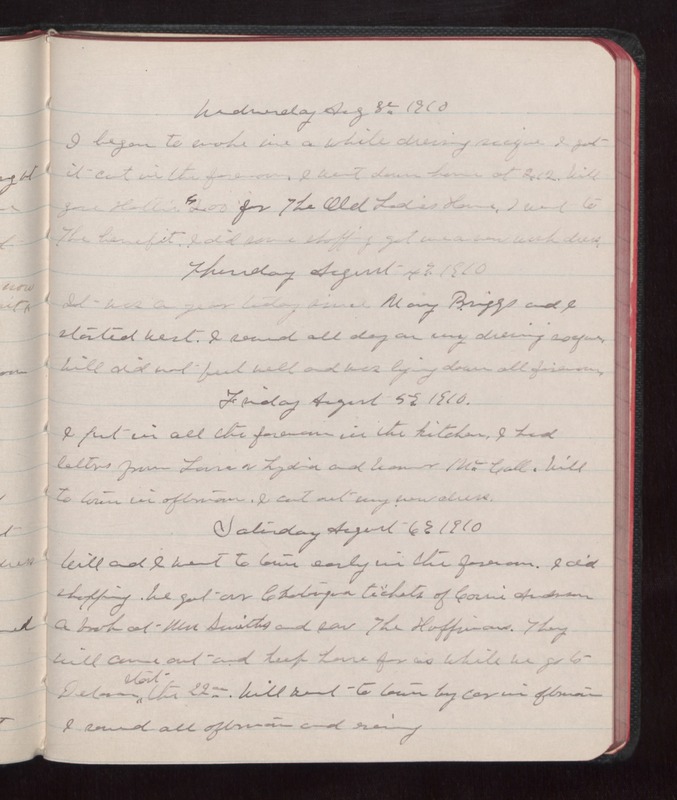 Wednesday Aug 3 1910 I began to make me a white dressing [illegible] I got it cut in the forenoon. I went down home at 2.12. Will gave Hattie $2.00 for the Old Ladies Home. I went to The benefit. I did some shopping got me a new work dress. Thursday August 4 1910 It was a year today since Mary Briggs and I started west. I sewed all day on my dressing [illegible]. Will did not feel well and was lying down all forenoon. Friday August 5 1910 I put in all the forenoon in the kitchen. I had letters from Lorna & Lydia and [illegible] McCall. will to town in afternoon. I cut out my new dress. Saturday August 6 1910 Will and I went to town early in the forenoon I did shopping. We got our Chautauqua tickets of [Corine?] Anderson a book at Mrs Smiths and saw The Hoffmans. They will come out and keep house for us while we go to [Delaware?] start the 22nd. Will road to town by car in afternoon. I sewed all afternoon and evening.